Maybe the most damnable characteristic of these House and Senate provisions, other than the sheer favoritism for the already wealthy, is the favorable treatment in determining the rate at which income is taxed for “owners” compared to the disfavored treatment for taxation of workers’ wages. 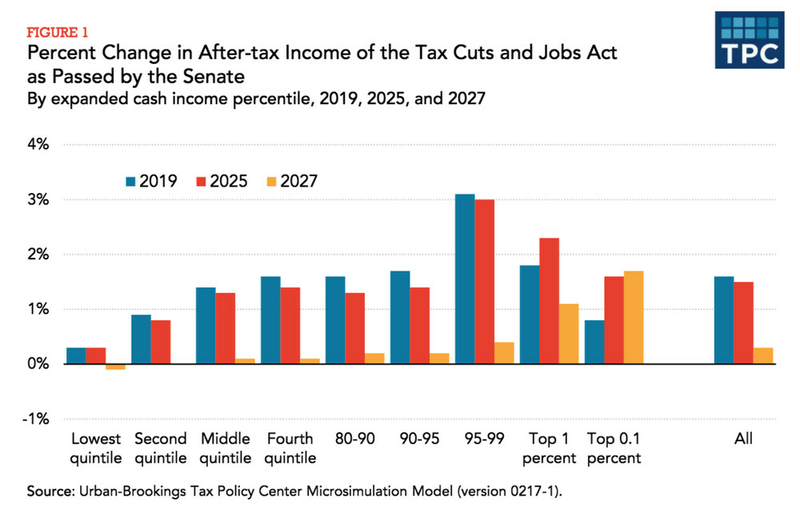 As the Tax Policy Center notes, the Senate version of the tax bill “would reduce taxes on business owners, on average, about three times as much as it would reduce taxes on those whose primary source of income is wages or salaries.” Paul Krugman, Republicans Despise the Working Class, NY Times (Dec. 15, 2017), at A27. And this dissing of the working class goes along with treating partners in real-estate partnerships (like the Trump family and many other real estate developers) with kid gloves: “a partner in a real estate development firm might get a far bigger tax cut than a surgeon employed by a hospital, even though their income is the same.” Krugman, Republicans Despise the Working Class, NY Times (Dec. 15, 2017) (quoting Howard Gleckman at the Tax Policy Center). Note that this is an off-the-top reduction of what would otherwise be personal taxable income taxed at the taxpayer’s individual tax rate. Workers who are paid wages get no such break. And wealthy people will use good lawyering and tax planning to organize their businesses so that their income is counted as pass-through income rather than wages. This is just a continuation of a trend of favoring passive ownership of capital in this country. See, e.g., the Berkeley Blog, Wealthy investors to win bigly with Republican tax plan ( Nov. 9, 2017). Imagine a company where two siblings as owners and a third sibling is the principal employee. They all receive about the same income from the company–for the worker bee, as wages and for the other two, as a profit share. The worker bee does all the creative thinking and working. So the two owners pay tax under this provision on 20% less income than the worker bee. And this is true in an economy in which economists are generally agreed that pass-throughs are currently taxed favorably, taking everything into consideration, and “don’t need another break”. Dylan Matthews, The Republican tax bill that could actually become law, explained, Vox.com (Dec. 14, 2017). This pass-through provision is as clear a snubbed nose to all those who work hard to earn a decent living as one can imagine. Fact is, the “owners” are often the takers, and the “workers” are the makers. PS. The Vox article suggests that the corporate tax break is justifiable, based on the GOP “economic theory” that claims that a lower corporate tax rate will “spark so much additional investment in the United States that it would bid up wages and leave the middle class better off through its indirect effects.” Id. This is just another way to state the “supply-side” “trickle-down” theory that has been relied on for decades by right-wingers but has never been shown to be justified empirically. In 2004, the GOP made the same claim for its “repatriation tax holiday” for multinational corporations, claiming that the low tax would allow those corporations to invest and expand, leading to job creation. It didn’t. It led, instead, to share buybacks and more money for the shareholders. In fact, a large number of repatriating corporations that did share buybacks with the money also laid off thousands of workers. I was going to do this also as shown by WP. I am glad you did. Note that ending the mandate just means more folks will wager on their health. All that wished to sign up could have. (and still can where medicaid was expanded). And the rest of us will pay their emergency room bills, as well. Since it is now voluntary to count the lower amount of subsidies as a cut seems a strange way of counting but of course figures don’t lie but liars do figure. No, not quite. End the CSR subsidies and premiums go up which are picked up by ACA section 1401 where 1402 was ended. Congress “supposedly (claimed by Repubs)” never approved 1402 which is the issue. The court agreed with Repubs and an appeal never went forward as Trump came to office. As Charles Gaba and xpostfactoid will tell you if the states do it properly and apply all of the increased cost to the Silver Plans, Bronze plans will be free and low copay and deductible Gold plans far cheaper. The issue is if people are smart enough to go to them. Even a Bronze plan gets the basic benefits without cost. One other point, states could have a mandate also. Who will Trump hurt? Those in the individual market above 400% FPL. Been on top of this and advising Dems in Michigan.